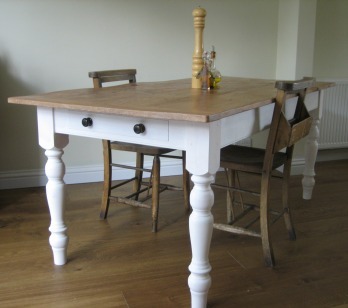 This traditional farmhouse table has a painted pine base and reclaimed Elm top. This ten foot long Oak table was commisioned by Llewllyn Harker architects for their office at East Penard in Somerset. The design of the green Oak table below was inspired by medieval cruckframed houses. All the joints are pegged, no adhesives or other fixings were used. A French styled solid oak table with two drawers. The table is finished with a natural beeswax to protect the timber whilst letting it colour naturally over time. Extending table in solid Oak.